Always a hotbed of fresh and diverse musical product, Sweden brings us yet another solid release this year in the form of ShapeShiftingAliens debut self-titled album, released via The Sublunar Society. Today we have the pleasure of presenting their new single ‘Love is a Battlefield’. And no, this is not a cover version of that 80s top charting Pat Benetar song. The accompanying video was animated by Niklas Rundquist. 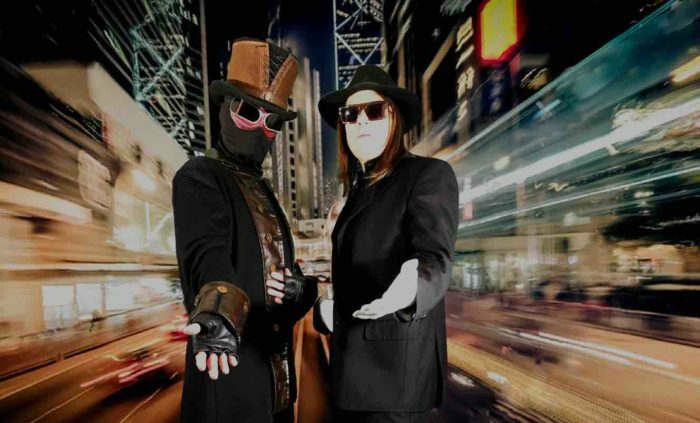 ShapeShiftingAliens is a Swedish duo, consisting of Johan Cléve on vocals and Niklas Rundquist, also known as a solo artist under the moniker Brainshadow. This new offering, however, sees vocalist Ingrid Contardo join Cléve for a duet. Together the two strike a sweet spot characterized by complete sonic harmony. Given that the whole album is an absolute stunner, we await their next material with great anticipation, including video material. For every video they have released since launching their musical career, every one of them has been a winner, oozing great talent. “This song is about the complexities of love and hate in relations between couples but, as with most of my lyrics, it can also be applicable to the complex relations between nations in peace and wartimes, says Rundquist. ShapeShiftingAliens signed to The Sublunar Society in 2016 and have since released several singles, followed by their self-titled ‘ShapeShiftingAliens’ LP. ShapeShiftingAliens’ inventive approach was noted by Nolan Cook of The Residents, leading them to collaborate on ‘Shadows’, the final track from their debut album. Rundquist and Cléve met when they were working with Iodine Jupiter. Cléve is a producer, composer, live and studio musician (guitar) for film, as well as touring and performing artists. Inspired by various film music composers and especially horror films, their music has also been influenced by David Bowie, Lou Reed, Goldfrapp, Air, Radiohead, Smashing Pumpkins, and Massive Attack. Niklas Rundquist / Brainshadow collaborates with other artists as an electric violinist, remixer and mastering engineer. Most recently, he cooperated with Lima 13 and Sonisk Blodbad. He is also a member of The Leather Nun, whose history runs back to the 1980s. He also composes music for films, documentaries and commercials, and various artists on the London scene. The Sublunar Society is a record label and publishing company, founded by Marie Lundvall and Peder Bjoerk in 2013. Sublunar releases music and publishes literature for the international and national markets. The company also produces exclusive limited edition art products for collectors. The guiding spirit behind The Sublunar Society is one of artistic freedom and creative exploration beyond the conventional. The ‘ShapeShiftingAliens’ album is everywhere digitally and also via Bandcamp, along with CDs, here. You can follow developments with ShapeShiftingAliens via their website. Follow them on Facebook, Twitter and Spotify.